Babies have soft and delicate skins that require special care to keep healthy. Apart from using recommended bathing soaps, for instance, the laundry detergent you choose should be non-irritant. It should also be hypoallergenic and leave the fabrics of your baby’s clothing smooth and non-irritant after several washes. To eliminate gambling from your shopping process, this article will help you to identify the best products that meet this threshold. After careful research, we have identified 10 of the most recommended baby laundry detergents that offer value. They are affordable, chemical-free, and have fast lathering ingredients that wash several types of clothes well. Which is the best baby laundry detergent for everyday use? If you have a baby, you most probably have grappled with the foregoing question when out shopping. For a memorable experience, consider this 100-ounce Dapple product. Large, affordable, and blended using natural ingredients, it is perfect for everyday cleaning. Its fragrance-free formula, on the other hand, not only lathers fast, but also lacks irritant dyes, SLES, SLS, and parabens. You will never harm your child’s delicate skin no matter the type of clothing you clean occasionally. This pediatrician-recommended detergent is 100% biodegradable and recommended for soothing eczema. A popular Biobased (95%) detergent, Mama Bear Gentle-Care is a mild product that works better than most harsh brands. Even though scented, this baby detergent is non-irritant. Each package washes up to 53 loads and comes specially formulated with stain fighting enzymes that boost its performance. Unlike bar soaps that require a lot of physical effort, you can rest as it does the heavy lifting. This USAD-certified detergent also rinses clean and lacks irritants such as dyes, artificial scents, and phthalates that irritate the skin. The fill cap offered, on the other hand, enables you to make accurate measurements when preparing for a washing session. Perfect for light-duty washing, All Ultra is a novel baby liquid detergent that sells in a 46.5-ounce container. Fully concentrated, its superior cleaning power is more than impressive. When cleaning soiled clothes, for instance, it neutralizes stains well without weakening fabrics. It also rinses fast, leaves clothes smooth, and lacks irritants (chemicals or dyes) that might affect your baby’s skin. This liquid detergent is safe for use in all washing machines. It lathers well and has a magical fragrance that perfumes clothes well without overbearing babies. 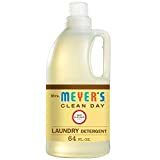 Recommended by mothers worldwide, this sweet smelling Mrs. Meyer’s laundry detergent is a perfect grime and dirt buster. Perfect for cleaning baby clothing, its fast-acting concentrated formula works well without damaging clothing. It is also safe on the hands and lacks chemicals such as phthalates and parabens that often harm babies. Mrs. Meyer’s Clean Day measures 64 ounces. Finally, the dermatologist-recommended natural ingredients (97%) used to make are safe on the environment (biodegradable). As such, you keep your baby clean and smelling fresh while keeping your environmental footprint low at the same time. 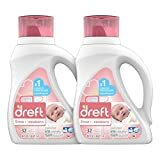 Trusted by pediatricians and mothers alike, this liquid Dreft Stage 1 detergent delivers every time. Attainable concentrated, for instance, this product lathers effectively. It is also hypoallergenic and attainable is a large 50-ounce container that cleans up to 32 loads of clothing. This is interesting, particularly to parents with many kids or those that wash large batches of clothing occasionally. Apart from its cleaning power, this product has featured in top 10 baby laundry detergents because of its affordability. In stores such as Amazon, you do not have to break the bank to own one. Its efficiency also saves users money they world have spent on low-quality detergent. 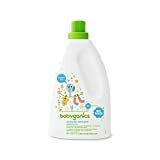 With Babyganics 3X, you receive a fragrance-free 60 fluid ounce detergent that cleans socks, napkins, and other baby clothing well. Dermatologist and pediatrician tested and approved, it is safe for everyday use. Its HE compatible formula also lacks dyes and optical brighteners such as chlorine and comes triple concentrated. With just a small amount, therefore, you will clean large batches of clothes without compromising its stain fighting power. Forget about scrubbing your baby’s dirty diapers for minutes, as is always the case using bar soap. This cruelty-free detergent neutralizes stains and odors well with little effort from users. 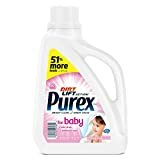 Formulated for babies, Purex Liquid is a skin-safe laundry detergent that retails is a large 75-ounce container. Its concentrated formula is long-lasting (up to 50 loads). The dry free and hypoallergenic ingredients used to make it come dermatologist tested, while its soft baby scent is alluring. It perfumes baby clothes well. It neutralizes pungent baby odors and keeps fabrics smooth and non-irritant over the years. If you have a tight budget, the price charged at Amazon is hard to beat. For a few dollars, you get a quality detergent that works well with all HE washers and washing machines. Biobased laundry detergents are safe baby accessories that neutralize stains well without impairing the quality of fabrics. 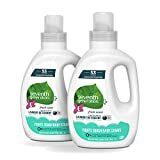 This pack of two Seventh Generation model, for instance, is a dependable USDA-certified product made of natural ingredients (95% Biobased). Each container weighs 20 ounces. Caps have graduated measurements, while and the enzyme-fortified formula offered blended to fight stubborn stains well. Whenever you are cleaning vests or soiled diapers, this non-toxic product delivers. Finally, you do not have to worry about synthetic fragrances, dyes, or optical brighteners. It is safe for hand washing and use with HE and standard washing machines. 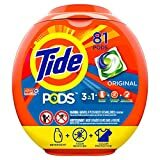 Retailing in an 81-load package, Tide PODS is a scented laundry detergent that cleans six times better than bar soaps. Sweet scented; its premium formula is perfect for cleaning smelly clothing such as soiled diapers. It also brightens whites well and has potent stain removers that clean well in hot and cold cycles. Finally, attainable concentrated; Tide PODS lathers well and rinses with less water. 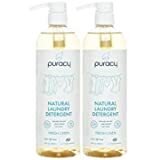 Soap, clear, and chemical-free, Puracy Natural is a high-efficiency baby detergent with an effective 10X concentrated formula. Enzyme-powered, its cruelty-free formula eliminates the toughest of stains and strongest of odors. Puracy Natural is doctor-recommended for allergy sufferers and babies with sensitive skin. It is also an acclaimed industry leader because of its affordability and versatility. Apart from apparel such as diapers, you can use it to clean septic tanks and grey water systems.